Looking for a New Chevrolet Impala in your area? CarGurus has 3,144 nationwide Chevrolet Impala dealers with 10,790 new car listings. The latest-generation Impala introduced for 2014 has already proven to be a significant improvement over its predecessor, and Chevrolet is content enough with the current model that 2018 doesn’t bring many significant changes. The biggest updates include three new exterior colors—Nightfall Gray Metallic, Graphite Metallic, and Cajun Red—and the addition of keyless ignition and a reversing camera as standard equipment. A Sunroof and Spoiler package has also been introduced, and more standard features have been added to each trim level. Impala buyers have the choice between a 2.5-liter 4-cylinder engine or a 3.6-liter V6, both of which are paired with a 6-speed automatic transmission. The 4-cylinder makes 197 hp and 191 lb-ft of torque, while the V6 is much more potent at 305 hp and 264 lb-ft and can hit 60 mph in under 7 seconds. The EPA rates the 4-cylinder model at 22 mpg city, 30 highway, and 25 combined and the V6 at 18, 28, and 22. The engines feel a bit anachronistic compared to the current crop of smaller turbos, but buyers who really want to maximize economy could consider the similarly sized Chevy Malibu. The Impala has struts up front and a multi-link suspension at the rear, and it weighs in at around 3,800 pounds. All trims are front-wheel drive (FWD) and can be ordered with either the V6 or 4-cylinder engine. For 2018, the base Impala LS trim now comes standard with a movable 8.0-inch touchscreen. The infotainment system is compatible with Apple CarPlay and Android Auto, and the screen slides upward to reveal an extra USB port and a lockable storage bin. Base models no longer feature solely cloth upholstery but instead the cloth/leatherette combo of mid-range Impalas. The LT trim adds standard LED daytime running lights, and the range-topping Premier now includes navigation, a universal home remote, a Bose Centerpoint Surround Sound system, wireless device charging, and a 120-volt power outlet. Premier models also receive leather seat upholstery and ambient lighting. A Convenience Package adds a heated steering wheel. All models come with air conditioning, a power-adjustable front seat, and cruise control. Standalone options include 19- or 20-inch wheels, ventilated seats, a power passenger’s seat, an 11-speaker Bose sound system, a sunroof, and navigation. Cargo space for the Impala stands at an impressive 18.8 cubic feet, and there are a fair number of cubbies, storage bins, and cupholders throughout the cabin. 4-cylinder models feature active noise cancellation, while the more expensive trims come with thicker glass and extra sound-deadening material. A reversing camera is now standard across the Impala range, and available safety features include blind-spot monitoring, lane-departure warning, adaptive cruise control, and forward-collision warning with automatic emergency braking. In crash testing, the National Highway Traffic and Safety Association (NHTSA) gave the 2018 Impala a 5-star overall rating, while the Insurance Institute for Highway Safety (IIHS) awarded the 2017 model Good scores in all areas except the small frontal-overlap test. While a basic Impala LS starts at just under $28,000, a Premier model loaded with options can run over $40,000. 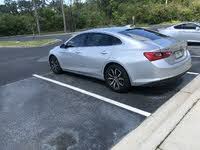 Competitors include the Ford Taurus, Hyundai Azera, Toyota Avalon, Nissan Maxima, and Buick Lacrosse. While it’s a clear upgrade over its predecessor, the current Impala still doesn’t rank ahead of any of its competitors and is somewhat lacking in features—especially considering its price. Even so, the 2018 model proves that Chevrolet is attempting to address these shortcomings, with more standard features than ever to help keep it competitive. What's your take on the 2018 Chevrolet Impala? Guru52B8B Everyone that rides in my new Impala is surprised at the high level of elegance, smoothness, quietness, power unexpected features like heated steering wheel, ventilated seats, Bose sound system, blue ambient lighting, in dash phone charger, backup camera, auto frontal crash braking, adaptive cruise control, lane assist warning, large 8 IN. active infotainment screen with voice activated navigation, WIFI with many USB ports, 110 volt outlet, keyless everything. All this for around 34000.00 with 20% discount off of 41000.00 sticker price for the upscale Premier Impala model. Timothy After driving upscale European sedans for many years I had to drive the new Impala LT because of its great looks. Wow! This car offers so much for the money. I honestly can say if blindfolded you couldn't tell you wether you were in the Impala or a Mercedes S class. The more I drive it the more I like it. Super quiet, comfortable and smooth. 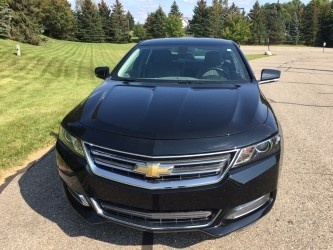 Users ranked 2018 Chevrolet Impala against other cars which they drove/owned. Each ranking was based on 9 categories. Here is the summary of top rankings. Have you driven a 2018 Chevrolet Impala? Enter your zip to see incentives for a new Impala in your area. Where Can I See My Odometer On A 2018 Impala? Where is the odometer on my new 2018 Impala?